This contest is open to all professional editorial cartoonists. With the submission the contestant declares that she/he is older than 18 and has all the legal rights to submit the cartoon and entitles Brexit - The Cartoons to show them as part of the exhibition Brexit - The cartoons at the Goethe Institutes. Selected submissions might be compiled for a printed catalogue and possibly shown as part of the media campaign on facebook, twitter, this website and websites of the Union of World Cartoonists and the the Goethe-Institutes. You accept also that we contact you via the email address you provide for contest and exhibition purposes only. We won´t give your personal data away to anybody. For security reasons your IP will be recorded. You may submit as many cartoons as you want. The cartoons must have a minimum technical quality: 300 dpi and at least a minimal long side of 2000px. They will be exhibited without further editing centered at a size of DIN A4, so in best case please include works already aligned on printready format DIN A 4. You may enter whatever you consider to be a Brexit Cartoon. A pre-jury will find wether your cartoon is eligible for the contest and the exhibition. The pre-jury is ongoing during the open entry time and all successful contestants will be announced on this website. Then the main Jury will take place. All contestants will be admitted with no distinction made regarding nationality or age. Permitted are works by professional editorial cartoonists and such aiming to become one. The theme is the Separation of the United Kingdom from the European Union called Brexit. The cartoons have to be made during the separation process beginning with the peoples vote campaign and anding with the last possible date of entry. The Exhibition is open to all sides, remainers, leavers, britons, non britons. Contributions have to be digital works. They shouldn’t contain an explanation of the drawing. They shouldn´t contain any copyright stamps, watermarks or whatsoever information besides the cartoon itself. The digital works has to be sent in JPEG format with a minimum of resolution of 300 dpi (2480 x 3543 pixels). Dimensions including any passe-partout 21 x 30 cm (A4). Number of entries per contestant is open. The entry includes the entry form which is signed by the artist/holder of the property rights. You may enter cartoons on multiple instances. After every upload you will get a confirmation email once the prejury has reviewed your entries. The property rights of all contributions will remain untouched with the artist/holder of the legal rights. 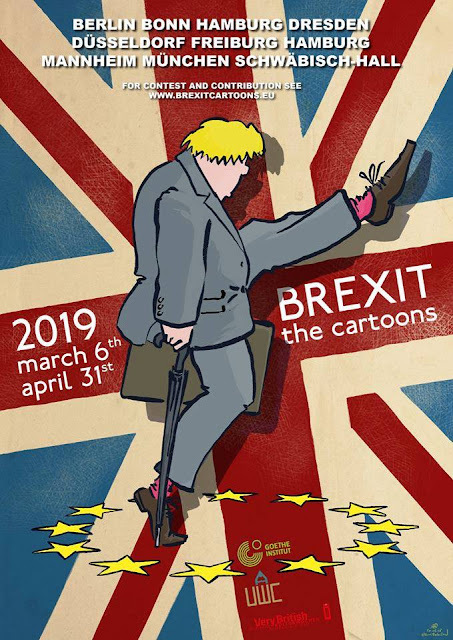 But the uploader declares with the upload that he is the holder of the property rights and agrees agrees with the entry, that selected works may be used by "Brexit-The Cartoons" to promote the contest. And naturally the contestant agrees that his/her works are shown as part of the exhibition “Brexit – The Cartoons”. The jury consists of professional artists, cartoonists and laymen. Decisions made by the jury cannot be challenged. Selected works will be considered for inclusion in a catalogue. The deadline is February 22nd 2019 at 24:00hrs. The contestant declares by submitting works to the contest, that he accepts this rules and the privacy police and agrees to be contacted by the contest website via email.